Field sets allow for addition of fields to an ordered list that can be used dynamically inside of Visualforce. They are most useful for managed packages since they can be deployed with them and then customized by the end user without having to have access to the Visualforce code in the package. In order to create our PDF we will need three field sets. One for the Battle Station object, one for the Resource object and one for the Supply object. To create the field set, navigate to the object definition page and click the New button under the field set section. On the next page, you define the available fields as well as which ones are currently in the field set. For a non-managed package scenario, like what we are dealing with, there may not be a need to have a field that is available but not in the set. 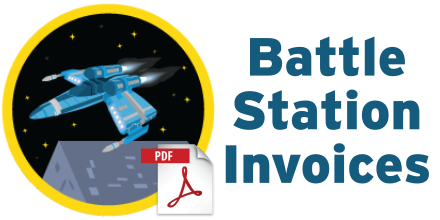 For ease of use, I’ve named all of the field sets “Battle Station Invoice” across all three objects. To now take use of these new field sets, we need to update the Visualforce. Instead of having each row / column specifically defined in our Visualforce, we will need to pull the field set data down and use that in our code. Above is a truncated version that does not have the CSS. If you would like full code with the CSS you can find that here. Let’s look at our supply table generation. By defining a class on it based on the field name, we have a CSS selector we can use to target that field specifically. This can then be repeated for the resources table as well. The only downside of this approach is that if you add new fields that need a different justification, then you will have to alter the Visualforce page to change them. However editing a single line of CSS is way easier than adding new stuff to a repeat deep inside a Visualforce page. The completed Visualforce page with all the updates can be seen here. This entry was posted in Development, Salesforce and tagged field sets, pdf, Salesforce, trailhead. Bookmark the permalink.